Those houses up there are pretty safe from the sea-level rise projected this century. The first day of winter found me standing in the middle of the Yachats River estuary on the Oregon coast. (Good thing the tide was out.) And as usual when I’m in that place, I thought about the slow and imperceptible rise in the level of the sea. Now and then we hear about that subject in the news, and usually the tone is one of alarm. For a more reliable assessment, I looked up a 2012 report published by the National Research Council, an arm of the National Academy of Sciences. 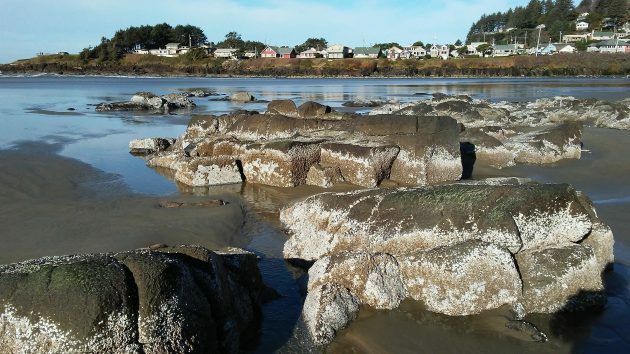 You can find it online: “Sea Level Rise for the Coasts of California, Oregon, and Washington: Past, Present, and Future.” One of the many scientists on the committee responsible for the report was Phil Mote of Oregon State. It’s a long report. The authors considered everything that influences the level of the ocean in relation to the West Coast. Among other things they considered long- and short-term weather patterns, ocean conditions such as El Niño, gravitational forces exerted from various quarters, tectonic shifts that lift up parts of the coast while making others sink, and of course the effects of climate change. Based on all that and a whole bunch of calculations and statistical techniques, they venture a range of projections of how much the sea will rise, and how fast, compared to the level in the year 2000. The findings are summarized in a table on Page 117. 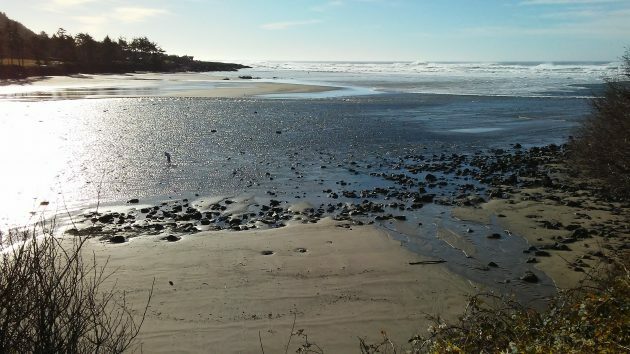 For the central coast of Oregon, centered on Newport, the report projects a sea level rise of 6.8 centimeters (almost 3 inches) by 2030; 17 centimeters by 2050, and 63 centimeters by the time this century ends. The authors point out there’s a great deal of uncertainty because of unforeseen changes in the many factors at play. The change could be bigger than they project, and it could also be less. For example, they estimate that the change by the year 2100 could be half again as large as the projection. Or it might be only half. One thing they are pretty sure of is that there’s an event that could change the sea level on the coast in a big way, and really fast. That’s a subduction zone earthquake like the last one in 1700. When it happens again, part of the coast would likely drop about three feet in a matter of seconds, and the ocean would suddenly be three feet higher. Too far away to make out, there’s a surfer in the waves out there. Sea level is of interest only in relation to where it matters, like on the coast. So if the coast drops and nothing else changes, the sea is obviously higher (in relation to the coast). A much more immediate concern is be the measured levels of cesium-134 from Fukushima in Oregon’s coastal waters. Think twice before dipping toes in the water or consuming the catch. The lowest common denominator is the sea along the Oregon coast. Besides, HH may decide to write up a blog post about the subject. I can think of many things that are off-topic. Here is one! How about the Rockettes being forced to perform at “the donald’s” inauguration despite their objections. Imagine women being required (at risk of losing their gig) to do something against their will in conjunction with the pres.-elect. Off topic and ironic. The story brings to mind a question. Since both land and sea are moving, how does one pick the fixed datum as reference? Seems like a zen coan. On the other hand, stuff will happen whether we humans understand or not. Enjoy the ride, whether it be Yachats or Homer.